Anheuser-Busch will launch a new beer in 2012 with the Bud Light Platinum. With a slightly sweeter taste, higher alcohol by volume (6%!) and signature cobalt blue glass bottle, Bud Light Platinum is supposed an upscale light beer option. Anheuser-Busch (InBev) announced Bud Light Platinum in early November. 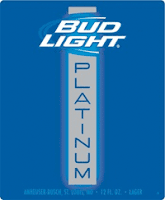 The announcement said that the sale of Bud Light Platinum starts on January 30th, 2012. Crain's New York reports that Anheuser-Busch will promote the new Bud Light Platinum with a Super Bowl Ad on February 5, 2012. Six Budweiser Super Bowl 2012 Commercials are coming. Two Ads will feature the new Bud Light Platinum, two Bud Light and two Budweiser Beer. The Super Bowl 2012 will have six Beer Super Bowl Ads just from a single brewery. I have no doubts that this will happen. It is not very often that Anheuser-Busch introduces a new beer. Super Bowl is the ideal venue to promote the new Bud Light Platinum. The Budweiser Super Bowl Ads have been consistently entertaining over the past years. I am pretty sure the Budweiser Super Bowl 2012 Ad line up will be extensive and fun to watch even if you do not like the beer.